I’ve always wanted to own a small fishing boat. So when I came across one being sold at a bargain price three years ago, I didn’t hesitate buying it. Overall, the boat’s condition was good. However, the installed CB radio was several years old and didn’t include basic features like GPS. It had to be replaced. I consulted several boating and yatch forums in search for recommendations about the best marine radios to invest in. Plenty of the answers I got recommended the Uniden UM380 CB radio. It’s now over 3 years since I bought and installed the Uniden marine radio. It still works great. That’s why I decided to write this Uniden UM380 review. The sea can be unpredictable. Having precise information regarding the prevailing weather in your location as well as locations ahead of you gives you time to prepare. The Uniden UM380 marine radio comes with built-in Specific Area Message Encoding Weather Alert (SAME). This feature sends an emergency or NOAA weather alert directly to the boat. The Uniden fixed mount class D radio features a Digital Selective Calling feature. This is a safety feature required by the FCC for marine CB radios. The DSC capability includes a distress button and position send and request. The latter feature allows you to send and receive exact position location. Coupled with the unit’s GPS capability, you can rest assured that coast guards or other boats can easily locate and rescue you in times of distress. It also features all USA, Canadian and international marine channels. Mounting this Uniden VHF marine radio is simple and should take less than one hour. It comes in a compact 11 by 9 by 4-inch lightweight chassis with a white finish. All mounting hardware is provided and includes the mounting bracket and microphone hanger. I like the way the front panel is designed. It has a fairly large backlit LCD display which shows the radio menu, DSC features, GPS data and channel names. The buttons are also backlit making the UM380 marine radio easy to operate in low light conditions. It’s built in memory scan and ability to save channel names comes in handy when I want to find a specific channel fast. The triple watch feature allows me to monitor 3 channels simultaneously. With regard to durability, this Uniden fixed mount marine radio is waterproofed to protect it against splashes and rain. Although all mounting hardware is provided, I had to invest in a Uniden UM380 antenna separately. But this was understandable since many marine CBS don’t come with their antennas included. If you love spending time out at sea, a high-quality CB radio is one of the important investments to make. 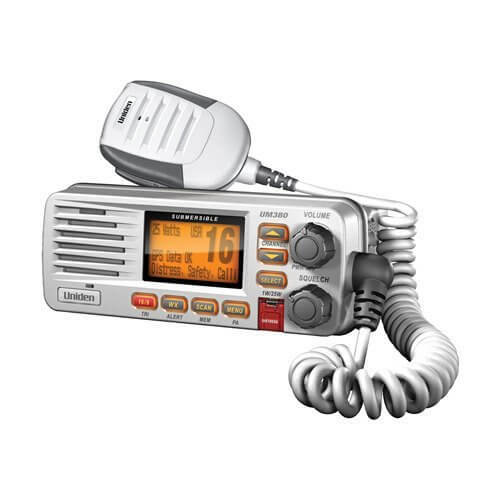 I would recommend this Uniden UM380 marine CB radio due to its compact design and included features. It’s easy to use and focuses on ensuring that you can send and receive information that’s crucial to ensuring that you’re safe out at sea. I hope this Uniden UM380 CB radio review offered enough insight into this unique CB unit that will sit neatly inside any boat cockpit.